You have to go a bit beyond the list of clubs that this kid has played for if you really want to see his genius. 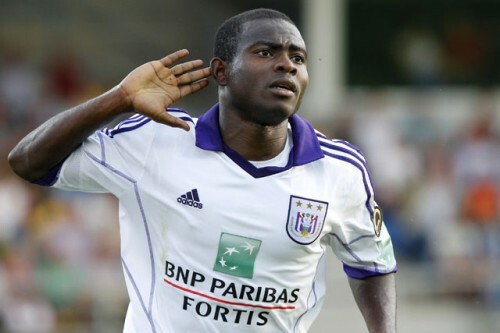 Rather than take the classic colonization route to Europe that has served many African imports well, Frank Acheampong decided that a trip to Thailand for a few years was in order first. Whether this was a crazy gap year decision from Acheampong or just a chance to quadruple his bank balance, he demonstrated just what a quality player he was either way. Whether he was still drink from the full moon party the night before, that’s for you to decide. He became most widely known by the muggles of this world by the absolute bargain he was when one bought him on Football Manager 2013. Bid £0 for him whilst he was at Burinam United, Thailand, and they would always accept it – possibly a demonstration from the developers that they knew he was destined for greater things outside of Thailand. Sure enough, after a loan spell there he must have made some sort of impression in training, as despite 0 appearance and 0 goals for Anderlecht, they made his transfer permanent, and has been nothing short of fantastic for someone born on the 16th of October 1993. With 23 appearances, 7 goals and 3 assists at the time of writing, the impact he has had on a team with such a massive reputation in Belgium is a highly impressive achievement. Making the left-wing position his own after a couple of impressive substitute appearances, he has a calmness in front of goal that is way beyond his years, as shown by the number of goals he pops up with. Able to play on the other wing and as a second striker, this players flexibility will no doubt be of great aid to his team if required, with the possibility of playing him up front not an unreasonable one. A very strong left foot, outrageous pace combined with a dribbling ability and composure on the ball that would have Theo Walcott jealous. He encapsulated this wide range of skill with one of his earlier goals for Anderlecht, coming on as a sub and running three-quarters of the pitch to slot in at the other end. Already on the books of his national team with a goal to his name, the man who started his career at the wonderfully named Ghanaian team “King Faisal Babes” has already been linked to the likes of AC Milan in the recent past, as well as stating that cliché desire to play in the Premier League. Belgium and Anderlecht has proved an excellent proving ground in the past for youngsters looking to set the world alight, so don’t expect this kid to be stuffing his face with waffles and chocolate for much longer. Be scared, rest of the world, as he’s only going to get better.